Want a floor sweeper with a steel construction? How about the FSW-11 Sweeper by Winco USA? Take note that Winco USA is different from WinCo Foods. Winco USA (which is also known as DWL Industries Co. according to their website), is a “manufacturer and worldwide importer of kitchenware and tableware.” It was established in 1992. How Does the FSW-11 Fare Among Consumers? The Winco catalog is filled with tons of tools for home and office use. So far, in their janitorial catalog, the FSW-11 Multi-Surface Sweeper is the only sweeper available. The rest are mops, brooms, and scrubs. So what are the features of the Winco FSW-11? For starters, there’s nothing sophisticated about it. Being a non-electric sweeper, the FSW-11 has a steel handle with a soft grip on top. Although it can’t be folded, it lies flat so you can work on places underneath furniture pieces. As a rotary sweeper, the FSW-11 makes use of a brush roll system which is made of natural bristles. Every push you make, the brush rotates and picks up dirt along its path. The dirt is deposited in two dust pans. 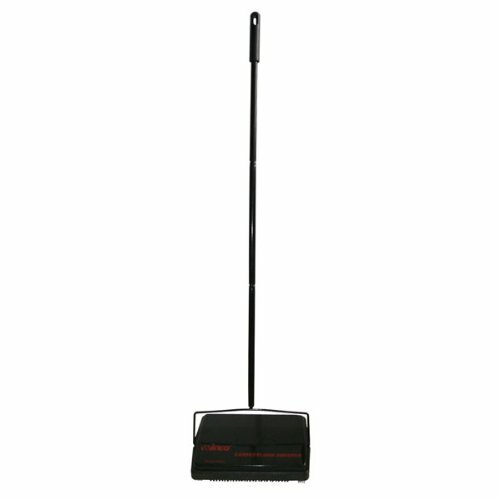 Weighing only 2.2 pounds, this sweeper is lightweight. Product dimensions include 43 x 11 x 7.8 inches. Is this made in the USA? Nope. It’s made in China as advertised. Although the steel construction of the sweeper unit is a plus, there are several negative feedback about the quality of the handle. Several buyers said that their unit’s handle broke after only a few weeks or a few months of use. Does the FSW-11 Sweeper by Winco USA clean up well? There are conflicting reports as to the effectiveness of this sweeper. While some are impressed with its performance, others are dissatisfied. When it works, it can pick up cat hair, your toddler’s small toys, and dirt. Also, the nature of the floor seems to affect the cleanup. Based on feedback, it appears that the Winco FSW-11 Sweeper works well on rugs or carpeted floors.